Articolo : TAM69569 Disponibilità : PochiPz. Circuito a due corsie per le mini4WD dotato di ponte e binari colorati di verde e blu. Le dimensioni del circuito assemblato sono: 216 x 120 cm. This course can be used at your leisure racing your Mini 4WD machine at your house as well as for testing your machine settings for official Tamiya races. The lane change section also comes with a transparent cover to prevent cars flying off the track. 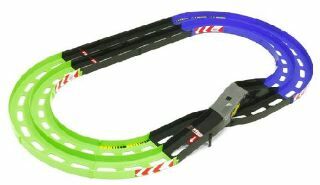 The soft plastic track helps to reduce the running sound when used. Other Mini 4WD circuit sections can be connected to allow you to make a larger circuit. Course Length: 2 laps approximately 10m, Fence Height: 5cm.